CANTON, Mass. (Nov. 30, 2011) – Baskin-Robbins, the world’s largest chain of ice cream specialty shops, has selected the top 10 finalists of its second National Online Flavor Creation Contest. Baskin-Robbins is now calling on ice cream devotees across the country to vote for their favorite. The winning flavor will be the July 2012 Flavor of the Month. From October 1 through October 31, Baskin-Robbins fans had an opportunity to be their very own “dessert chef” and create an ice cream flavor with the Baskin-Robbins virtual flavor creator. 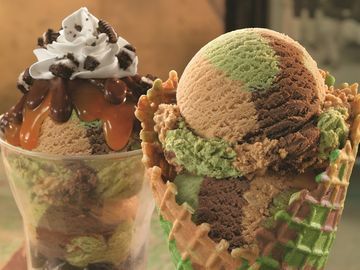 Nearly 40,000 consumers mixed and matched their own ingredients to create a signature ice cream flavor from 31 base flavors, a variety of ribbons such as fudge and peanut butter and a copious amount of mix-ins including candy pieces and cookies. For this year’s contest, Baskin-Robbins added new base flavors and mix-ins for consumers to create a flavor. The new editions to the contest included: Strawberry or Mango Yogurt, French Toast Ice Cream flavors, Oreo, Cherry, and Whipped Cream flavor ribbons, and Blondie Brownie, Golden Oreo, and chocolate covered cookie inclusions. Fans can vote for their favorite ice cream creations beginning today through December 12 at www.BaskinRobbins.com. Magic Bar, Leslie Pearson, Orange, CT: This seven layer bar consists of coconut ice cream, dark fudge, graham cracker and chocolate chips. Lemon Icebox Pie, Robert Ryan Reece, Bayonet Point, FL: Tangy lemon ice cream, whipped cream swirls and honey-sweet graham cracker pieces. Snap, Crackle, and Caramel, Christina Brumfield, Colorado Springs, CO: White Chocolate Mousse ice cream with chocolate rice crunchies and caramel sauce. Carmel Batter Bash, Marcia Campbell, Lexington, Mass. : Cake Batter ice cream with Heath Bar and chocolate chips. Chippity Chocolately Chew, Paula Brooks, Westford, Mass. : Chocolate Chip ice cream with a fudge ribbon and fudge brownie pieces. Cold Mine, Judy Gewuerz, Fresh Meadows, NY: Chocolate ice cream with an Oreo icing ribbon, walnuts and fudge brownie pieces. Nutty Creamcheese Brownie, Kelsey Lien, Santa Clarita, CA: Chocolate fudge ice cream with a cream cheese ribbon, walnuts and fudge brownie pieces. She Devil Pie, Kelebra Williams, Compton, CA: Strawberry ice cream with a cream cheese ribbon mixed with pie crust and strawberry pieces. Chocolate Cookie Crumble, Elissa Decarlo, Glenmoore, PA: Chocolate ice cream with an Oreo icing ribbon with chocolate chips and Oreo cookies. Blueberry Bliss, Claudia Gdowski, Dearborn Heights, MI: White Mousse ice cream with blueberries, almond pieces and chocolate flakes. “For the second year in a row the culinary team at Baskin-Robbins was impressed and amazed with the creative flavor submissions we received,” said Stan Frankenthaler, Dunkin’ Brands Executive Chef and Vice President of Innovation. “It’s a challenge to narrow down the submissions to ten finalists, but we are confident that ice cream lovers across the nation will have fun voting for the next great flavor to be featured in Baskin-Robbins dipping cabinet in 2012. Each finalist wins free ice cream for a year, and the grand prize winner will have their flavor added to the Baskin-Robbins ice cream library and the new flavor will be featured as the July 2012 Flavor of the Month. The grand prize winner will also receive a trip for two to Boston which includes a three-night stay at a landmark Boston hotel, a night at the theatre, $1,000 in spending money and a trip to Baskin-Robbins headquarters where the winner will meet the Baskin-Robbins culinary team and spend a day bringing their virtual flavor to life. During the first 2010 Baskin-Robbins online Flavor Creation contest, the winning flavor that was selected from 40,000 entrants was Toffee Pecan Crunch created by Diane Sroga of Chicago. For more information and official rules, please visit http://baskinrobbins.com/flavorcontest/.